Besides the paper dolls and the book sets, there were only two pieces of Trixie Belden merchandise offered to fans. 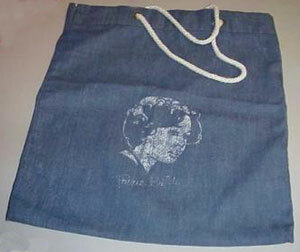 The tote bag was advertised for sale in the third Trixie Belden Mystery Fan Club Newsletter published in 1977. It's sale price was $5.95 but readers could get it at a discounted price if they sent in a coupon with tokens. Read the special offer. This was offered for sale in the Fan Club newsletters as well as in specially marked books. View the advertisement. This also appeared in the Australian "Trixie Belden Presents" books for Julie Gordon and Shelley Peters, re-released by Golden Books.